What Is a Treadmill Good For? Treadmills fill gyms and can offer a workout option in your own home. The machines feature a moving belt as a running surface and come in both manual and motorized models. Treadmills work for all fitness levels because of the user's ability to adjust the speed and incline of the platform. The machines work for a variety of purposes and goals. Those who prefer walking or running outdoors face inclement weather or other conditions that make the workout difficult at times. A treadmill offers an alternative place to do your normal walk or run without worry about the weather or your safety in poor conditions. You are still able to exercise in a similar manner, whether your goal is general fitness or training for a race. Indoor exercise with a treadmill gives you a consistent, controlled environment. People training for specific events can engage in tailored training sessions. Runners who want to improve their times can include speed work that involves intervals of faster running. The treadmill allows you to control your speed and distance more accurately than free running outdoors. 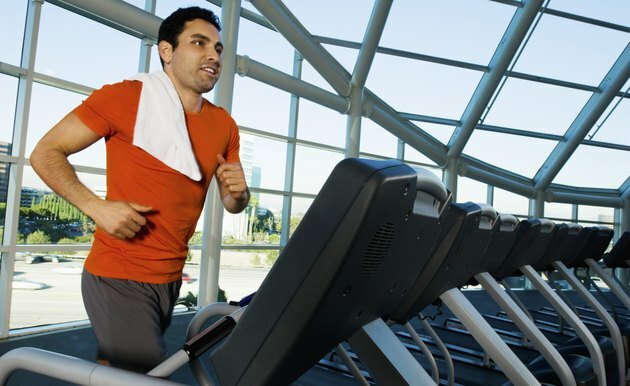 A treadmill also helps with pacing if a runner struggles to maintain a consistent speed while free running. The controls of the treadmill allow you to set your pace and the moving belt can be adjusted to keep you on that pace. When training for a race, running under conditions that mimic those of the race gives you the best preparation. Walking or running on a treadmill is a form of aerobic exercise, which burns calories. Regular use of a treadmill helps you lose weight, especially in conjunction with healthy changes such as an improved diet. The moving belt and absence of wind resistance make running on a treadmill easier than outdoor running. This is beneficial for beginners, who may be able to run longer on a treadmill than they can outdoors. A treadmill offers a cross-training opportunity for those who don't regularly walk or run. For example, if you usually swim or cycle for aerobic exercise or athletic training, a session on the treadmill adds variety to your usual workout routine. You break up the monotony of doing the same activity every day and use your body in a different way than usual.